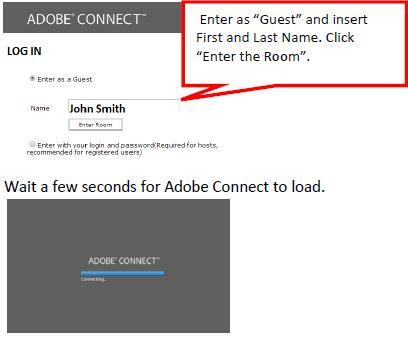 If you do not have the latest Flash Player and Adobe Connect Add-in, you will be guided to install the latest version. Please complete this as soon as possible. You may not be able to participate otherwise. Click on or insert the link into Internet Explorer browser, 10-15 minutes before the meeting begins. The meeting room will open 15 meetings before. Use the 10 minutes before the meeting begins to ensure your volume settings and headset settings are adequate. To do this, click on “audio set-up wizard” and follow the steps. If Audio is echoing, under Advanced Audio Settings, turn off Gain Control and turn off Echo Cancellation. If you are unable to hear audio, close all browser windows and reopen the online session.